There are a few simple steps that anybody can use to effectively turn their ideas into action. In this second installment of our series, we‘ll show how a petition is formulated, supported and presented. Several factors can influence your decision to use a petition. Just remember that a petition will be useful if your goal is SMART: Specific, Measurable, Attainable, Reasonable, and Timely. Is your goal actually possible? What do you need to make your petition effective? Who else supports your cause? Does your petition have a clear target? Can this petition open a dialogue? 1) Is your goal measurable, actionable, easily communicated and actually possible? General complaints and nebulous goals such as “save the whales” need to be fine-tuned. The goal for a petition should be defined, direct, and achievable. If the hope is to protect the whales, start by thinking about the imminent threats to their survival and how to combat them. In this petition, the creator identifies how the current plans to remove humpback whales from the Endangered Species Act would threaten the species. There is a clear message with a well-defined and measurable goal that will ultimately help save whales. 2) What do you need to know to make sure your petition will be effective? What are the current obstacles to address before a petition will be effective? For example, if you want to convert a vacant lot in your neighborhood into a park, you should talk to public officials about zoning, feasibility and environmental impact so that you‘re armed with information before rallying the public. Additionally, a little research into your issue may uncover a new opportunity to start a petition around to build support toward a larger goal, like more green, public spaces across your city. Likewise, if you‘re leading a fight for the humpback whales, you should be fully informed about the dangers that still remain for whales — perhaps even calling and speaking directly with scientists involved in these issues — before rallying the public. Understanding why an action you disagree with is being taken (delisting the humpback whale, in this case) is your best fuel for reversing or preventing that decision. Also, research upcoming meetings where officials will be discuss delisting the humpback whale, and notify supporters about where it will be and who will attend, so that the message can reach the right people. 3) Are there groups, businesses and influential individuals that support your cause? Have the people that back your cause already begun to initiate social or legal change? If so, do other petitions already exist around your issue? Is there an upcoming meeting where officials will be discussing your topic? Make sure to browse existing petitions to see if there are others already lobbying for your cause. If you find an identical or similar petition, it may be beneficial to promote the existing petition rather than risk diluting your audience and response. Especially with an international issue like protecting whales, you want to consolidate your voice. That is the very point of a petition! An offer to help deliver an existing petition, while promoting the cause to your own circle of friends, will add a boost of momentum to propel the issue forward. You can use your previous research to strengthen the message, bringing new information to those that already support the cause! 4) Does your petition have a clear target? Remember that once you have garnered support for your cause, you need to clearly communicate your ideas for change with someone who can actually help! Addressing your petition to a specific member of a business or government will be successful than delivering a petition to the entire nation. In our Humpback Whale petition, our recipient, The National Marine Fisheries Services, is crystal clear! 5) Can this petition open a dialogue? What are you hoping to achieve with a petition? Are you lobbying an individual or an organization with the ears to listen? Also, whom are you hoping to ultimately inspire to join in support? 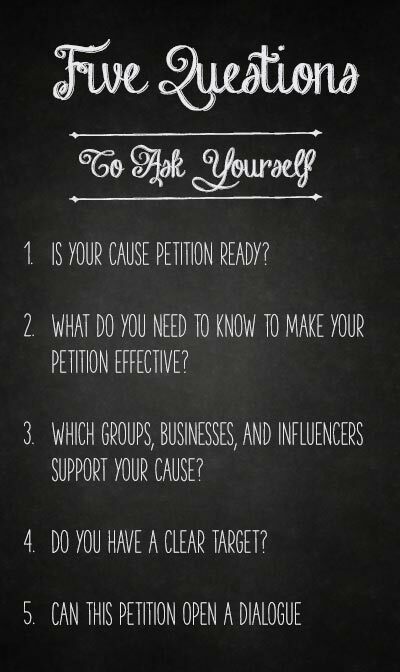 Identifying BOTH your target for the petition, along with who will support your cause, creates two separate dialogue opportunities. Our first opportunity for dialogue occurs directly with our petition target. If your target is unlikely to respond initially to the request of your petition, you can raise public awareness and get the general public thinking and talking about your issue! After all, raising awareness is essential to creating change! Looking back to our petition regarding Humpback Whale preservation, we find that the target for our petition is the National Marine Fisheries Service, a branch of NOAA. Their ultimate goal is the overall protection of natural resources. They rely on respectful dialogue between companies and governments to ensure preservation of animals and their habitat, and it‘s likely that many employees there entered the field because they care deeply about marine animals. In this example we have a perfect target candidate for a petition. A successful petition can raise awareness OR be a catalyst for policy change. Just make sure you‘re lobbying someone who is interested in listening! If you‘re still wondering if creating a petition is the next step for you, feel free to ask our experienced team! For further tips on honing your message and your audience, check back for part three of our series on successful petitioning, as we dig deeper on targets for your petition and other strategies to get your ideas rolling!